From what I read, Irene (the character) is Dupuis's grandmother. I hope I can get an ARC for this one! 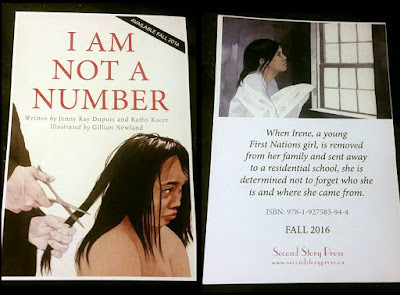 See my review of I Am Not a Number. I don't think Irene was Dupuis' grandmother. Carlisle school closed in 1917 and was for American Indians. Dupuis is Canadian. Additionally, my grandmother was born in 1913 and I am 60. From appearances, I could easily be Dupuis' mother age. I looked up the Carlisle school because I had a great grandfather who came out of Pennsylvania who've I've researched and I was looking at the dates. However, Dupuis does the same consulting work as you, and I am guessing she will be fairly accurate. This book is not set at Carlisle. There were many boarding schools in the US and Canada, some closed and others did not. Santa Fe Indian School, for example, is in New Mexico and still open--but run by the Pueblos--so quite different from Carlisle. Thanks Debbie, I will read the link. The last Residential School of this type in Canada closed in 1996, much to my shame as a Canadian, and the hideous abuses were happening well into the 1950s and 1960s. Hi Ann, the story is about my grandmother's experience being taken from a First Nation community in Northern Ontario (Canada) and being relocated to live at a residential school in Spanish, Ontario. It is based on the story that she shared with me during my teenage years combined with family memories (old photos, etc.). It would be nice to get your feedback (Debbie's as well) once it is released in September 2016. Jenny. I am a high school teacher in North Bay. Are you ever available to speak to classes ?? ?